Hear an excerpt of a new installation on the Isle Of Skye via our Soundcloud. Photos by Richard Skelton. 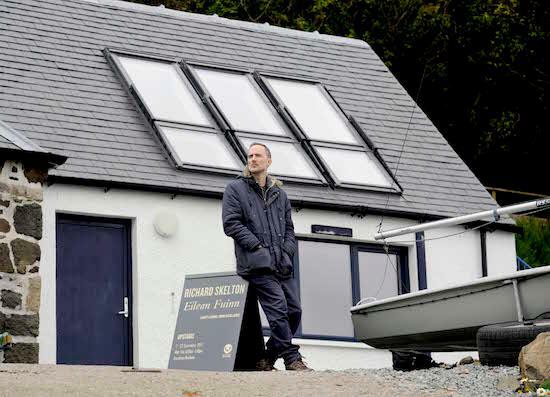 Ahead of Richard Skelton's appearance at the Unsound Festival next month, we've got an exclusive listen to an excerpt of music he's composed that you can currently listen to at a boathouse up on the Isle Of Skye. As ever with Skelton's work, the eddying piece, half drawn-out bagpipe drone and swirls of electronics, acts as a mirror both to the landscape and the thoughts and memories we might place upon it, at once unconventionally meditative, challenging, and strange. The process of creating the piece began in 2016 when ATLAS Arts, in partnership with Artangel, brought Bethan Huws' 1992 film Singing For The Sea to the Isle of Skye. Huws’ film documents a group of eight Bulgarian women, the Bistrista Babi, who Huws invited to travel from their home in the heart of Eastern Europe to the edge of an island, to the north east coast of England. She then asked the women to sing to the North Sea. This film installation marked the start of A Work for the North Atlantic, a year-long programme of commissions, exhibitions and workshops exploring singing and the sea. As part of this ATLAS commissioned a new piece of work by Richard Skelton. Skelton has created a multi-channel composition that evokes Huws’ work and its re-sited presentation in the Scorrybreac boathouse, Portree. He has turned his attention to the west, from the North Sea to the North Atlantic. Exploring traditional songs, field recordings, and inspiration from the landscape of Skye, its seascape and the stories that accompany them, Eilean Fuinn suggests that the sea and the landscape are "endlessly singing to each other" over the vastness of geological time. The installation is at the Skye Sailing Club at the Scorrybreac Boathouse at Portree on the Isle of Skye until this weekend. Skelton plays this year's Unsound Festival in Krakow, Poland on October 8th, followed by a Q&A with tQ's Luke Turner on the afternoon of the 9th. For more Unsound information, go here.